A meditation garden, whether nestled in a small city space, suburbs or open country can be a great place to unwind, relax, contemplate, rejuvenate in spring, summer, fall,or even in winter! The key to fitting everything in a small space is to use an intensive planting technique. I double dug all the area for the trees and shrubs so I could space them closely together. Double digging involves digging down one spade's depth, and then digging down a second spade's depth, and mixing organic fertilizer in the newly created 2-foot deep hole. This gives the roots plenty of nutrients and drainage. I've been using double digging at least 20 years with great success! 1. Greenery to look at while sitting on a lawn chair. For the larger items I put in 1 English boxwood that I'm trimming to be cone shape; 1 yellow cedar tree; 3 yew that are naturally cone shape; 1 holly; 1 ivy bush, 3 rose bushes against the fence and 1 photinia bush. The foliage of these are all different colors and all are winter-hardy at 50 degrees latitude - nice if you wish to use your meditation garden all year long. 2. A path made of small pavers meandering through the 12' circle of shrubs. 3. An inspiring garden statue. 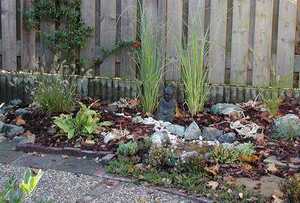 In this garden I chose a Buddha and a free-form sculpture I made myself from oblong pieces of granite. 4. A water feature - mine is a bird bath - and a few of my little bird friends have come to trust me; visiting when I'm out there near them and sitting very still. 5. A small patio to sit my chair on for meditation - my patio is made of aggregate concrete pavers but anything you like would work. View #2 shows the patio at right where I have my lawn chair for meditating. I use my meditation garden as a time to listen to the sounds of birds, the playfulness of the neighborhood children and even planes overhead. It is a time of deep rest for me; I feel like I'm nurturing my soul and spirit. The key to creating green roof or balcony garden spaces is to choose plants that will survive in very little thickness of soil and rock. 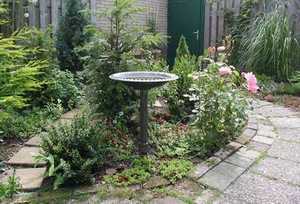 Following are some ideas to create these gardens. In the photo see a green roof garden planted on a flat section of shed extending out from a 2nd floor deck that also has built in planters. This is the portion to look at while seated on the balcony. It is your view of green providing calm and peace amidst a sea of the tar paper shed roofs in the neighborhood back yards. My shed roof was already waterproofed with heavy duty green roofing paper. To protect it from pebbles in the garden above I laid down a mat of 1/8th inch recycled roofing felt. Over this is a layer of lava rocks about 1/2 inch in diameter. Next the turf layer. I chose succulents rather than grass, but turf grass is an option. For the sake of interest and to make it look like a meadow I cut slits in an X shape, and tucked in small perennial herbs. I spread out the roots of the herb plants to make them as flat as possible, to stay in the turf without being blown out in strong winds. If you live in a climate that goes more than a week or two without rain you'll need to sprinkle your turf the first couple of years till it is really established. My roof garden is 3 years old now and even has earthworms thriving, so many birds alight and eat, especially the blackbirds and crows. Here in The Netherlands our crows are called Jackdaws and have a collar of light gray; pretty birds, really. Around the edge of the roof is a fascia board with holes drilled for drainage that extends an inch above the top of the turf. I sit on the wooden slatted balcony garden surrounded by lavender, rosemary and tall grasses in the built in planter boxes. 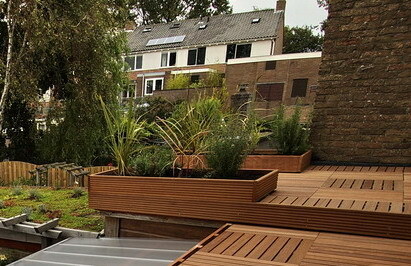 The planters have bases of slatted boards set an inch apart for drainage. I laid permeable garden cloth on the floor of the boxes. 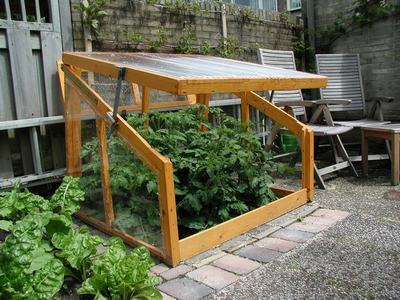 This is an open weave black plastic material that repels weeds and allows water to easily drain through. With 6 inches of soil space total, I filled the lower 2 inches with sand and 4 inches of potting soil above. Because you have 6 inches depth to plant in, you can choose larger plants with larger root systems for the planters. But you still may need to spread the roots sideways to get enough nutrients. After the initial planting I strung 2 wires lengthwise from screws drilled in to the inside near the top edge of each end of the boxes. Then using a lighter weight garden wire I tied each plant loosely to the long wires to keep them from being lifted out in storms. In our weather, here on the coast, we have strong winds regularly. So far no plants have lifted out. Okay, all the plants are in and thriving and it's time to sit and enjoy a good meditation amongst the greenery. It's as if sitting on a hillside and feeling the wind and sun against your skin; your own meditation retreat from daily life! 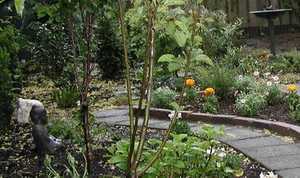 Walking a meditation path in your own garden is a private time and space to rejuvenate and regain peace! In the photo see that I have laid 12 inch (30cm) square by 1 inch (2.5cm) thick pavers in a winding pattern so that the path completely crosses the "forest section" which is 12 feet (4 meters) across in 2 intersecting lines. This layout shows there are 4 points of entry onto the meditation path - giving lots of variety to your contemplative walk. I spaced each paver to be able to comfortably step from one to the next. Tools I used to lay the pavers: a small hand trowel; a small bubble level; a garden rake. Method: Using the rake - mine is 15 inches (37.5cm) across - drag it through the garden to form a pathway through your bushes or trees. Then place your pavers at comfortable walking distance apart. Then, starting at one entrance, lay the bubble level on each paver, and with the small trowel dig out or build up the underlying surface till the paver is level. I set my pavers to be above ground level to keep surrounding earth from washing over them in the rain. Now, stand back, admire your work and go ahead and enjoy walking your garden meditation path! With winter's passing the meditation garden comes alive, taking on the character of an inviting friend - a place to spend some peaceful quiet time. I feel uplifted when I see each bush and plant stretch out in April's warmth! Here is a view of my meditation garden in April - the tall thin spruce in the right background in front of the bench is the Christmas tree I planted just before New Year’s Day. 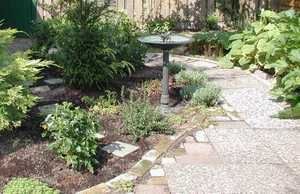 For more ideas on elements to include in your meditation garden click here. Enjoy a few minutes in your garden as often as you can - listen to the sounds of nature; enjoy the scents of early blooms. Draw to yourself the peacefulness of your meditation garden. 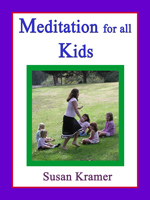 Fall is a great time to sit in your meditation garden or take a quiet walking meditation through a park or nature. The wind picks up, foliage is revealing its colorful nature, leaves rustle, the air is crisp and invigorating. If you decide on the walking meditation begin with a deep cleansing breath, stretch your arms overhead and to the sides and down. Lean over and reach for your toes and straighten up. Now begin your walk by taking even strides and counting in a regular pattern to get your steps and breath coordinated - this helps to calm and center your mind. Example: breathe in for 2 steps; breathe out for 2 steps; breathe in for 2 steps and continue. Back in your meditation garden, this is a good time to finish pulling weeds and mulching the ground for winter. I like to get the bird feeder ready for when the ground is frozen, and I make sure the bird bath has water - even when the water freezes I go out and break it up each morning for the jays and doves to enjoy. All year long the meditation garden provides a respite from daily cares - a mini-vacation right at home! 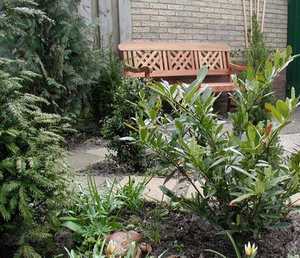 Do you like order and form and have a small space for a meditation garden? Here's a photo and description below of how I created a quiet place to meet those needs! 1. A Garden statue for inspiration. 2. Specimen winter-hardy plants. The grasses I used here survive all year at the 50th latitude. 3. A water feature. 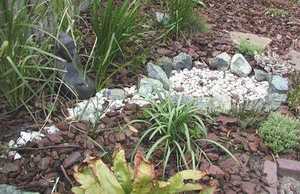 I cheated with this and created a dry stream bed and dry pond to mimic the real thing. I dug out the ground and laid in two sizes of stones: 2" white round pebbles and then I ringed the pond area with larger rocks about 6" in diameter. I used the largest rocks on the ground before I laid the ground cover to make the scene look more natural; like a forest setting. 4. 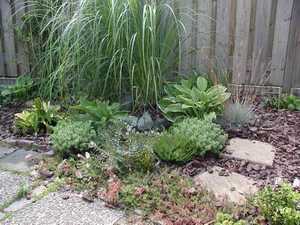 A ground cover to keep weeds down and provide an orderly appearance. I used a medium size bark mulch. 5. For seating, I created a little enclave alongside the garden in a 6' length. I doubled the width of an already present aggregate pathway from 3' to 6' in that section and sat a lawn bench on it - facing the garden. I really love sitting in my little garden, relaxing and feeling the peacefulness of just being mindful of the moment. Mindfulness, moment to moment, is a meditation practice in itself! As this little garden is tucked in the back corner of my yard I can sit there unseen and undisturbed. Even in winter I go out and sit on the bench in the early afternoon - as weather permits. If it is very cold I take a walk. Whatever time of year, whatever space you have outdoors - even if just a balcony or patio - isn't it invigorating to spend some quiet minutes meditating in the outdoors! Moving into the ripeness of summer time in the meditation garden brings the reward of long warm days, insects humming and a feeling of lushness in the burgeoning foliage. Here is a view of my meditation garden. Notice how the garden statue of Buddha is nestled in the long full reeds. The photo below is an overview of my original planting of 12 bushes and trees to complement each other and give a feeling of being in a forest setting. Believe it or not, a gray ringed-neck dove comes and bathes while I’m sitting right there in a chair in my meditative quiet - my own peace dove! 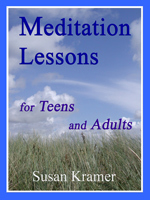 For ideas on elements to include in your meditation garden read the other articles in this series. Enjoy them now for soon they'll pass. Long days of summer, a welcome repast. Use your meditation garden to really sit back and rejuvenate before the busy-ness of fall and holiday activities begin! Is there any walk more peaceful than through the falling snow? All life seems calmed and stilled. Birds sit tight to knobby branches. Ducks float gently on an unfrozen space of pond. Winter meditation outdoors is a time to harmonize with stillness and quiet; to realign with inner peace. 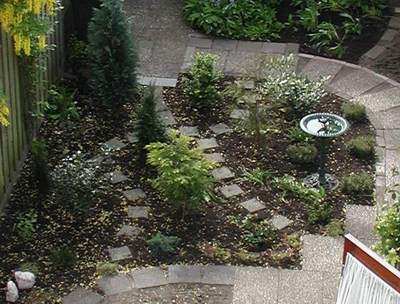 A small meditation garden can even be created in the city. Sitting in your meditation garden, walking in a park or along a snowy street is an opportune time to practice regular even breathing. If sitting - counts 1, 2, breathe in; counts 3, 4, breathe out. And, if walking - take 2 steps while breathing in; 2 steps while breathing out. After a few minutes seep within to your own center of warmth. Reflect that in the meeting of stillness outside and within, we reach a natural balance of appreciation and attunement with the rhythms of life; the coming and going of day and season. Finish your outdoor meditation with a deep breath in and out; going indoors revitalized! Meditating in your garden is a great way to start your day and carry the peace along with you, or to run to at day's end as you would to a refreshing lake, and dive into a quiet meditation. Either way you come up renewed with freshened energy to go on with your projects. You don't need a large space to meditate. Here are some ideas for a small city space. Also you can go out in your garden to meditate all seasons of the year if you dress appropriately. I bundle up in cold weather as sitting still the body temperature lowers. I love to sit on my back bench after lunch because I work at home and it is the place the sun shines the most reliably, being on a south-facing wall. You want to take location for your meditation chair or bench into consideration if you plan to use it throughout the seasons as I do. I've learned to meditate listening to the soothing sounds of nature, especially the seasonal and all-season birds. Our male black birds sound like they are singing a repertoire of songs and it amazes me how an animal so small can have such a voice that carries through the neighborhood. In the early evening he sits atop the highest tree and gives us a concert. Just listening to him is a meditation. Sometimes I feel the beauty and diversity of creation to the extent I cry for joy. So, make your meditation garden a place you, too, will enjoy year round!